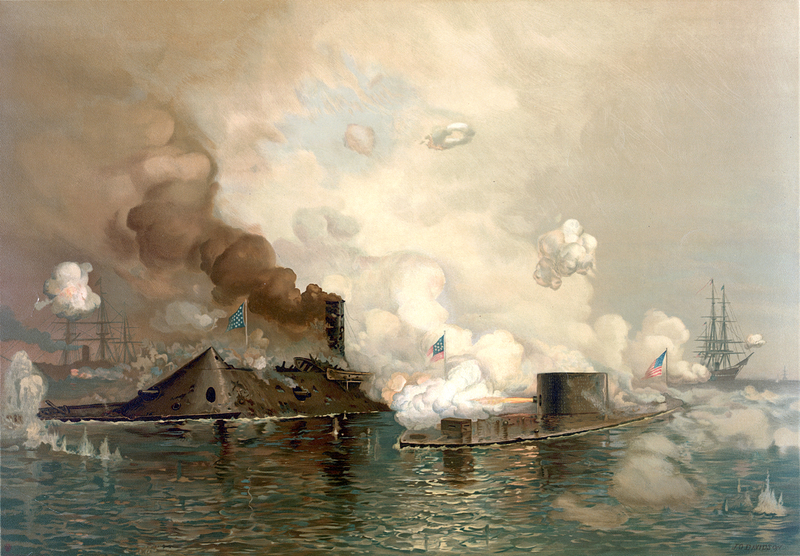 The March 9, 1862, battle between the Monitor and the Merrimack (CSS Virginia) during the American Civil War (1861-1865) was history’s first duel between ironclad warships. The engagement, known as the Battle of Hampton Roads, was part of a Confederate effort to break the Union blockade of Southern ports, including Norfolk and Richmond, Virginia, that had been imposed at the start of the war. Though the battle itself was inconclusive, it began a new era in naval warfare. The fight made every navy worldwide obsolete, because the age of the battleship had just arrived. During the Civil War, the Confederacy attempted to redress an imbalance in firepower and resources by investing in technology. One element of this program involved the protection of Confederate warships with iron plating. 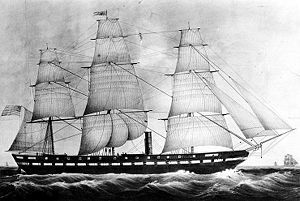 When Union naval officials learned that Southern shipwrights had converted the scuttled steam frigate USS Merrimack into the ironclad CSS Virginia they feared that this powerful vessel might be able to break the Union blockade at Norfolk, and bombard Fort Monroe or even steam up the Potomac River and threaten Washington, D.C.
By mid-1861, the North desperately needed ships to counter the Confederate ironclad, and on August 3, 1861, Congress authorized a board of naval officers to inquire into the construction of armored vessels. One of the most unconventional ship designs proposed to the United States Navy was by John Ericsson, and his vessel featured the shallowest draft and shortest estimated completion time of all the other projected models. Ericsson's design, however, met with great skepticism. 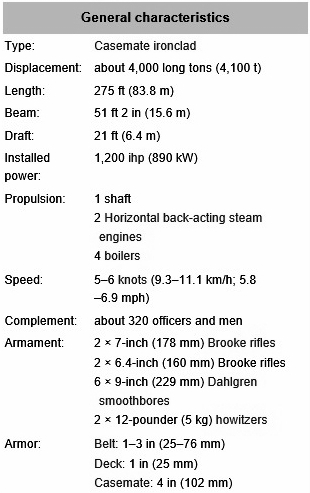 The vessel would have an extremely low freeboard, turret-mounted guns, laminated iron plates, and relied completely on steam power. The ship's quick construction time, however, was the key factor in the Navy's decision to build from Ericsson's design. Named the USS Monitor, John Ericsson's vessel illustrated the industrial growth of the United States during the 19th century. The ship was built by teams of inventors, mechanics, and engineers, and though these individuals were intimately associated with technological change, they were generally self-taught and worked without the benefit of a strong theoretical background. The 172 ft long Monitor, completed by February 1862, featured a revolving iron turret that was 22 ft in diameter, 9 ft high, and weighing 140 tons. On March 6, after completing its sea trials, the new vessel was towed from Brooklyn, New York to join the blockading squadron off Virginia. 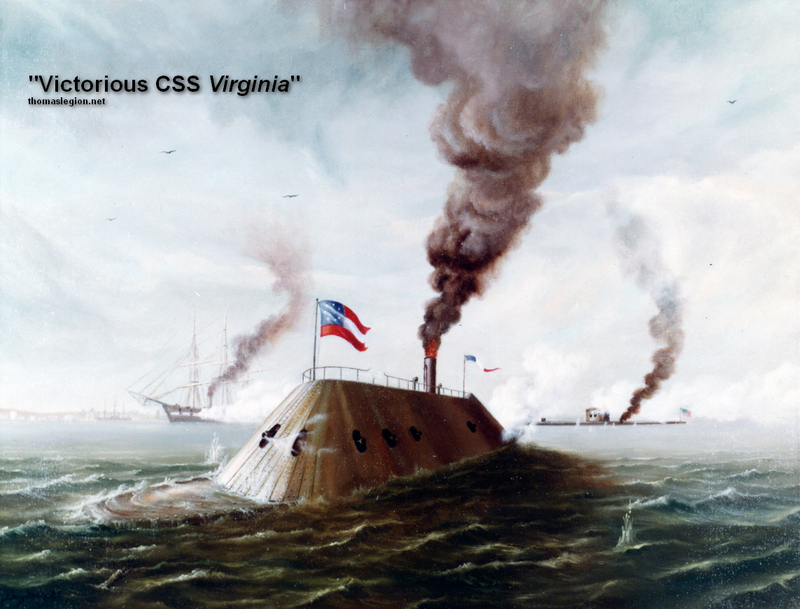 On March 9, 1862, the Monitor engaged the CSS Virginia in the historic Battle of Hampton Roads. While the skirmish itself was a draw and neither vessel was seriously damaged, the Monitor played a significant role in maintaining Union control over this key Southern port. More important, the battle caused American naval strategists to question their reliance on wooden warships. In addition, the revolving turret and protective armor belt, made famous by the Monitor, became standard features on latter generations of battleships. On December 31, 1862, nature not cannon fire overpowered the Monitor. While being towed to Charleston, South Carolina by the USS Rhode Island, the Monitor sank during a large storm off the coast of Cape Hatteras, North Carolina. (About) "The Monitor and Merrimac: The First Fight Between Ironclads", a chromolithograph of the Battle of Hampton Roads, produced by Louis Prang & Co., Boston. Signed "Jo Davidson." 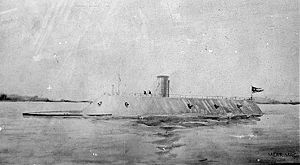 Merrimac, which was actually the name of another Union vessel, remained a common yet popular misspelling of the ironclad Merrimack. Image courtesy Library of Congress. The CSS Virginia was originally the USS Merrimack, a 40-gun frigate launched in 1855. The Merrimack served in the Caribbean and was the flagship of the Pacific fleet in the late 1850s. In early 1860, the ship was decommissioned for extensive repairs at the Gosport Navy Yard in Norfolk, Virginia. The vessel was still there when the Civil War began in April 1861, and Union sailors sank the ship as the yard was evacuated. Six weeks later, a salvage company raised the ship and the Confederates began rebuilding it. The Confederates covered the ship in heavy armor plating above the waterline and outfitted it with powerful guns. Rechristened the Virginia, it was a formidable vessel when launched in February 1862. On March 8, the Virginia sunk two Union ships and ran one aground off Hampton Roads in southeastern Virginia. The next day, the USS Monitor steamed into the Chesapeake Bay. Designed by Swedish engineer John Ericsson, the vessel had an unusually low profile, rising from the water only 18 inches. The flat iron deck had a 20-foot cylindrical turret rising from the middle of the ship; the turret housed two 11-inch Dahlgren guns. The Monitor had a draft of less than 11 feet so it could operate in the shallow harbors and rivers of the South. It was commissioned on February 25, 1862, and arrived at Chesapeake Bay just in time to engage the Virginia. Both ships met ignominious ends. When the Federals invaded the James Peninsula two months after the Battle of Hampton Roads, the retreating Confederates scuttled the Virginia. The Monitor went down in bad weather off Cape Hatteras, North Carolina, at the end of the year. In 1973, the wreck of the Monitor was discovered at the bottom of the Atlantic Ocean. Many artifacts from the vessel have since been recovered and are on display at the Mariners’ Museum in Newport News, Virginia. Though they had short lives, the two ironclads ushered in a new era in naval warfare. The Birth of the Ironclads! 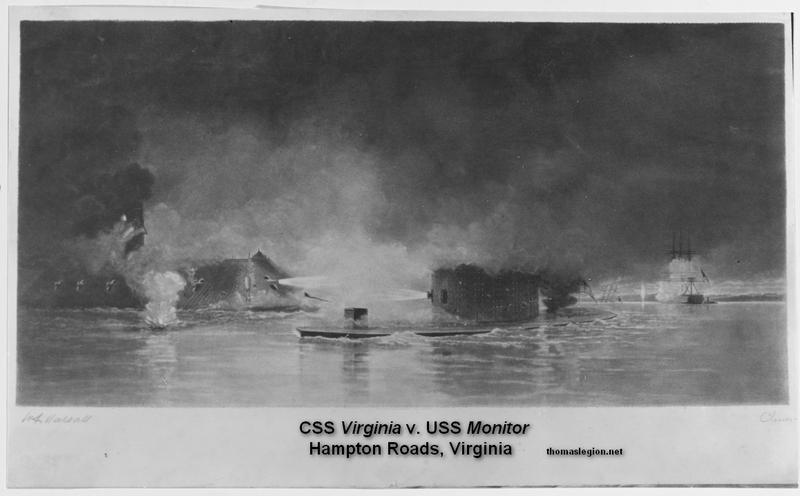 (About) Battle between USS Monitor and CSS Virginia in Hampton Roads, Virginia, 9 March 1862. Lithograph by Closson Blake, after a painting by W.F. Halsall, depicting the two ironclads engaging at close range. Collection of President Franklin D. Roosevelt. U.S. Naval History and Heritage Command Photograph.